Check the Arts and Crafts festivals schedule below for this years events. 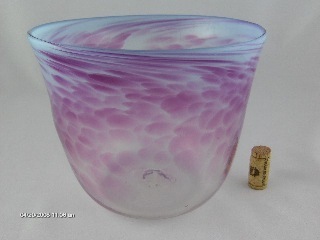 We offer a colorful variety of hand made glass items. Our selection consists of mouth blown glass vessels, hand made glass flowers, paperweights, furnace made marbles, and lampworked beads and marbles. All our pieces are individually handmade, using carefully selected color combinations and are proportionally balanced. Each piece is unique in color selection, size and shape. These carefully crafted works can be used as art decorations just as easily as functional and useful implements. As a progressive company, we want to give you the opportunity to stay in touch with our artisans and our product selection. We are continually adding new material, information and product selection. Our new content management system will enable us to always keep you up to date. Look for monthly updates, new, innovative and creative products. If you are not familiar with our company and your first contact with us is online, we would be pleased to hear from you! Please let us know what your needs and questions are, we will be more than happy to help. You can reach us at 703 268 1956. We are looking forward to hearing from you. You can also contact us at our e-mail address: frank@luckybreakglassco.com or info@luckybreakglassco.com . In brief, you should know the following about us: our company was established in 2007. We started creating the inventory as early as 2005. Our selection and volume is now well established and we offer unique and functional items. 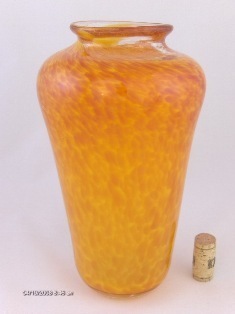 Our specialties are hand made glass vessels, art glass, glass flowers paperweights and marbles. Our regular customers particularly enjoy the creativity and value of our selection. We are a privately owned and operated business conveniently located at Fairfax, Virginia. Our web site is under continual revision and construction as new products are made and offered. We are making every effort to present you with our entire spectrum of offerings as soon as possible. Check this site often as new items become available frequently. 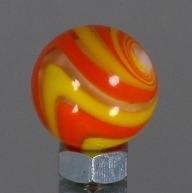 Lampworked marble: White core with clear core and orange and yellow stripes. About 3/4" diameter. Classes: Beginning glass blowing classes starting in October. Full working hot shop with molten glass furnace, re heat furnace, tools, annealer, clear glass and color selection and materials. Learn the basics of glass blowing. Call or email for more information. My daughter made this video of memaking a piece at the Veirs Studio Glass & Gallery in Warrenton, Virginia.